We explore some of the most common causes of mix failure we've tackled in our monthly Mix Rescue column. Banish these demons and you're most of the way to a devilishly good mix! Our recent cover feature on audio editing contains a lot in-depth practical advice on timing correction. For Mix Rescue articles containing practical examples of pitch correction see SOS August 2011, November 2010, October 2011 and October 2008, and for demonstrations of timing tweaks see the columns in May 2011, February 2010, and December 2009. Here's a detailed discussion of phase and polarity, with numerous case studies and some explanatory diagrams. Some audio examples showing the impact of phase tweaks can be heard in the SOS April 2010, November 2008, and March 2008 Mix Rescue columns. I've tackled muddiness in mixes on countless occasions in the Mix Rescue column. Some that will reward re-reading include SOS January 2011, November 2010, August 2010, May 2010 and April 2009. This is one of the most common things I have to contend with in Mix Rescue, so there are lots of articles to choose from if you're looking for additional tips. The SOS February 2010 and December 2008 editions demonstrate how to improve clarity by editing out mix clutter, while the July 2011, June 2010, March 2010, and November 2009 articles all deal with filling out and tightening up arrangements from a musical perspective. Here are a couple of useful general-purpose articles from SOS July 2008 and March 2006 on choosing and using reverb. Most Mix Rescue articles contain reverb tips, but those in January 2011, May 2010, January 2010, and August 2009 all discuss the subject in a bit more depth in conjunction with specific audio comparison files. There have been a couple of recent Mix Rescues SOS January 2011 and June 2011 where the 2‑5kHz regions has been a bone of contention. 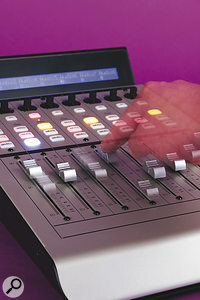 There are many Mix Rescue articles which illustrate different applications of detailed fader automation, especially in SOS January 2010, October 2009, August 2009, and December 2008. Some good examples of dealing with this kind of thing can be heard in the Mix Rescue articles from SOS June 2010, December 2009, and March 2009. The SOS May 2008 cover feature provided a good all‑round discussion of mix compression.